A plain gold wedding band used to be the standard wedding ring for a man. While this classic option is still popular, today's men have plenty of options when it comes to choosing their wedding jewelry. According to Elliot's Jewelers, the plain gold wedding band is still the most popular style of wedding ring for men. However, there's no reason to stick to yellow gold if you'd like something different. Elliot's Jewelers reports that white gold is actually even more popular. Gold bands are a great choice for a man who has classic taste and isn't too hard on his jewelry. Since gold is soft, it can be prone to scratching and denting if subjected to abuse. It's a little more expensive than some other metals, but plain gold bands are more affordable than those with diamonds and gemstones. Furthermore, gold wedding bands come in a range of widths and finishes, and they're hypoallergenic and easy to care for. 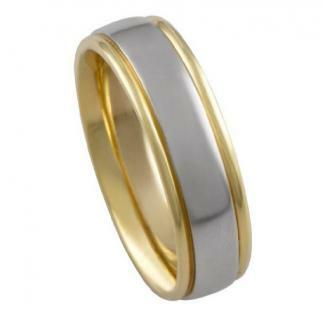 Four-Millimeter Men's 10k Gold Wedding Band - This simple design from Zales is a great choice. The four-millimeter, white gold band has a polished finish and a modern look. It retails for about $325. Low Dome 14k White Gold Band - Available at Blue Nile, this simple 14k white gold wedding band has a modern matte finish and square sides. The curved interior makes it comfortable to wear. It retails for about $650. Platinum is exceptionally durable and carries a certain cache. According to The Knot, these factors may be part of what makes it one of the most popular choices for men's wedding rings. Platinum bands appeal to men who want a traditional ring, but also want the very best. It's important to note that platinum is the most expensive metal choice for wedding bands. It's also especially popular in brushed finishes, but despite the durability of the metal, rings with this type of finish are prone to scratches. If a man works with his hands, this may not be the best choice for a wedding ring. 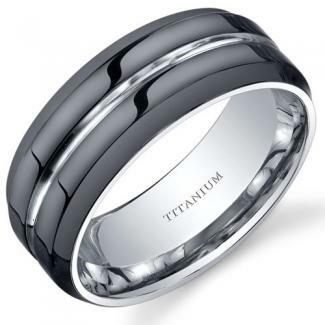 Milgrain Platinum Wedding Band - This beautiful ring from Tiffany & Co. is a generous six millimeters wide. It features two milgrain edges and square sides. This ring retails for $2,500. 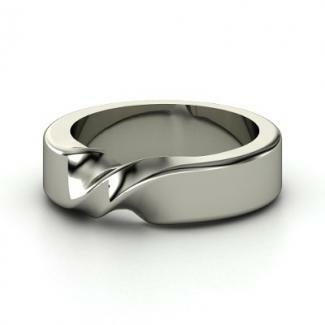 Men's Mobius Band - Platinum rings don't have to be plain, as this twisted band from Gemvara shows. The six-millimeter-wide band has square sides and retails for just under $2,800. According to TLC, titanium is another extremely popular choice for men's bands. This is partially due to the inherent durability of the material. Titanium is virtually indestructible, which makes it the ideal choice for men who have active lifestyles or jobs that are hard on jewelry. It's also one of the most affordable choices when it comes to wedding band. 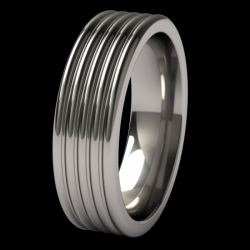 The major downside to titanium is that it is nearly impossible to resize, which means you would need a new ring if your ring size changed over the years. Titanium Stratus Ring - The classic Stratus ring from The Original Titanium Workshop features square sides and four engraved channels around the band. It's six millimeters wide and retails for about $60. Black Titanium Wedding Band - Titanium also comes in interesting colors, like this black ring from Amazon.com (pictured). Also featuring a narrow channel of silver-colored titanium, this ring is eight millimeters wide and retails for about $40. TLC also lists two-tone rings as among the most popular options for men. These rings feature two different colors of precious metal for maximum visual impact. The advantage of this option is that you don't have to worry about your ring clashing with your watch or other jewelry. Two-tone rings are excellent for fashion-conscious men who like to make a statement with their jewelry. They're available in a wide range of styles and metals. Warp and Weft Band - This unique ring from Gemvara is crafted in 14k rose gold and sterling silver, and it has a beautiful woven design. It's 7.64 millimeters wide and retails for just over $1,000. Men's Two-Tone Matte Finish Wedding Band - This simple 14k white and yellow gold style from Amazon.com (pictured) has a matte, brushed finish. It's six millimeters wide and retails for between $450 and $650, depending on the size. The Knot also reports that diamond bands are extremely popular for men. These rings have eye-catching sparkle, a lot of luxurious style, and the added benefit of coordinating with a woman's wedding band. They're perfect for men who want something a little fancier than an all-metal band. The only downside to diamond wedding rings is the cost, since these gems will add significantly to the price of the jewelry. Men's Tungsten Carbide Diamond Band - Crafted in durable tungsten carbide, this ring from Jared is durable and contemporary looking. A single round diamond sits in the middle of this two-tone, sleek band. This eight-millimeter band retails for about $400. Men's 14k Yellow Gold Diamond Wedding Ring - This 14k yellow gold ring from Ross-Simons features nine round diamonds that are channel set in the band, totaling half a carat. The six-millimeter band retails for about $1400. According to TLC, gemstone accents are popular on men's wedding rings. These may be a birthstone or simply a favorite color or gem. This type of ring is ideal for the man who wants to stand out or is looking for something a little different. Gemstones can vary in their durability, so it's important to keep this in mind if the man has an active lifestyle. Ruby Slash Ring - This stunning ring from Gemvara features a diagonal slash of three small rubies set in a square-sided sterling silver band. It is 6.84 millimeters wide and retails for just under $400. Men's Princess-Cut Emerald Wedding Ring - This beautiful design from Allurez consists of 0.80 carats of princess-cut emeralds set in a 14k white gold, brushed-finish wedding band. It is six millimeters wide and retails for about $1,700. On the list of the most popular men's wedding rings on JustMensRings.com, a large number of the offerings have decorative inlays. These inlays include wood, carbon fiber, shell, and stone. They give the ring a distinctive, eye-catching appearance, perfect for the guy who likes getting noticed. It's important to note that some inlays aren't as durable as the surrounding metal. Cleaning products, water, and even daily wear can damage their delicate surfaces. 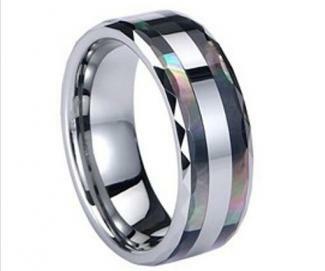 Men's Tungsten Ring with Black Double Shell Inlay - This striking design from Amazon.com (pictured) features two strips of iridescent black shell in a silver-colored, eight-millimeter tungsten carbide band. It retails for about $40. Rose Gold African Blackwood Inlay Wedding Ring - This gorgeous 14k rose gold ring from Exotic Savannah Woodworks is inlaid with two different kinds of wood. It is six millimeters wide and retails for about $1,500. Tungsten Gray Meteorite Inlay Wedding Ring - An inlay of slate gray meteorite graces this tungsten carbide ring from Titanium Kay. The band is eight millimeters wide and retails for $100. According to Forever Tungsten Ring, the Greek key motif is among their best-selling designs. This simple engraved geometric pattern is a great choice for the man who wants something a little different, but isn't interested in anything too flashy. You'll find Greek key wedding bands in a wide range of precious metals, so there's sure to be a ring that will fit any budget. Handmade Greek Key Band- This handmade 14k white gold band from Kobelli is a contemporary and striking design. It is six millimeters wide and retails for under $500. Titanium and Silver Greek Key Ring - This simple Greek key ring from Titanium Ring Co. features a blackened sterling silver inlay in a plain silver-tone titanium band. It's seven millimeters wide and retails for $325. The Knot also lists personalized rings as one of the hottest styles for men's bands. Expressing his personality or the things that make your relationship special can be a very meaningful and unique choice. There are many ways to do this. Engrave the inside of the wedding band with your names, your wedding date, a favorite quote, or a special word or phrase. Many wedding bands can be engraved. Choose a band that includes stones that have special meaning, such as birthstones, gems mined from your home state, or a favorite color. Have a band custom made by a local jewelry artist. You can get recommendations from your local college or university or through a favorite gallery. Pick a ring with a motif that speaks to your culture or ancestry, such as a Celtic wedding band or one with Native American engravings. Another way to personalize your wedding band is to choose one that is antique. This is a great option for history buffs or men who love the jewelry fashions of years gone by. It's important to note that men rarely wore wedding bands before the 20th century, so you may have a limited selection. Fortunately, there are several sites that specialize in these items. Antique Jewelry Mall - This shop sells one-of-a-kind antique men's bands, as well as reproductions of antique rings. The Marlene Harris Collection - Here, you'll find dozens of amazing antique options for men. The selection changes constantly. RubyLane - This online antique mall has a rotating selection of antique and vintage men's rings that may be perfect. With all the beautiful men's wedding rings on the market, you may have difficulty choosing just one. Although these rings are very different in style, price, and materials, they all do a wonderful job of representing the lifestyle and personal taste of the men who wear them. Simply put, there's a gorgeous wedding band out there for every type of man.